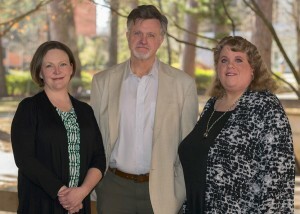 Dr. Heidi Harris, Dr. George Jensen, and Dr. Karen Kuralt, faculty in the Department of Rhetoric and Writing, have been awarded a 2017-2018 Conference on College Composition and Communication (CCCC) Research Initiative Grant for their study “Developing Effective Online Writing Programs: A Longitudinal Case Study.” The grant was announced March 17 at the CCCC in Portland, OR. The CCCC grant funds study into innovative research for writing instruction. Fourteen research grants were awarded across the U.S. this year. Harris, Jensen, and Kuralt will study how online writing programs can foster student success both during the program and after graduation. While most research in online writing instruction focuses on effective online teaching techniques in a single class, this study captures student experiences across both an undergraduate and graduate program. Reviewers from the CCCC Research Initiative committee cited the study’s rigorous research design and innovative deliverables as factors that led them to fund this project. UALR’s Department of Rhetoric and Writing is one of the first stand-alone writing programs in the nation. The department offers online and on-campus M.A. and B.A. degrees in Professional and Technical Writing and a Graduate Certificate in Business and Professional Writing.